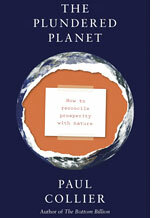 The subtitle of heavyweight economist Paul Collier’s book harkens to a very old question. Ever since the industrial revolution, savants, activists and lay people have split hair trying to reconcile prosperity with nature. In this volume of 270-odd pages, Collier examines how best to use the oil, coal, diamonds, timber and minerals that modern industrial civilization depends on while ensuring that human rapaciousness does not rob the future of everything. There is nothing strikingly original in the questions Collier asks. He looks at vexed questions as why oil has made Norway rich but diamonds have ruined Sierra Leone? How should economies grow without adding emissions? But the strength of the book lies in Collier’s use of the standard methods deployed by economists. At one point he shows through neat geometrical analyses that the wealth created by pumping oil must at least equal the notional value of the oil itself. Collier argues our economic and environmental interests are not, in fact, competing; they are mutually dependent. But his prescriptions are stuff of neoliberal development economics: the world will starve if we try to achieve harmony with nature. His messianic vision of GM foods coming to the rescue of developing countries does not account for the criticism of transgenic technology. Some of what he says is dangerous: poorest countries must open themselves for exploitation, and take responsibility for the climate change. But there is much in Collier’s book that should be salutary to international donors obsessed with the “small is beautiful” mythology. At one point, for example, he writes, Europeans and Americans share a nostalgia for their vanished peasantry and so inflict it on Africa. These sentiments have been influential in the international agencies, all of which depend on European and American funding. For 40 years their efforts to raise the productivity of African agriculture have been exclusively focused on small farmers. This has not been accompanied by any effort to raise the productivity of small farms.